a rodent with a very short tail that is not visible externally; native to South America, where it is raised for food; used widely as a laboratory animal in medical research. Vox populi A person used in any empirical situation, analogous to guinea pigs, which in fact have very limited usefulness as experimental animals; although use of the analogy has continued, the use of guinea pigs as test animals has not. 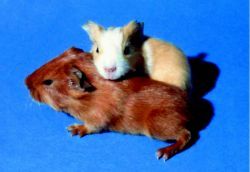 the domestic guinea pig, popular as a pet and as an experimental laboratory animal. Distinctive because of its requirement for a source of dietary vitamin C, long gestation period of 63 days and very mature young at birth. Comes in a great variety of broken and whole colors and color combinations, the most common being Himalayan (white with black points), tortoiseshell (patches of dark and light brown), tortoise and white, Dutch (white with brown or tan pattern), brindle, silver agouti (silver and gray underside), golden agouti (dark hair tipped with yellow), and albino (pure white with pink eyes). There are three varieties: English shorthaired—short, fine, glossy hair; Peruvian longhaired—long, silky hair obscures just where the vital structures of this guinea pig are; Abyssinian roughhaired—short, wiry coat composed of swirls or rosettes. Called also Cavia porcellus.